BANGI, 28 Oct. 2010 – The “Great Recession” of 2008 is now facing an uneven recovery across geographies and sectors with Asia, especially Asian industry, emerging as an “engine of growth”, said a Harvard professor here today. Professor Denis J. Encarnation said there is also a wide variance in the recovery which has also altered the relative rankings of countries, starting with the BRIC nations (that is, Brazil, Russia, India and China). “Asia’s share of World Gross Domestic Products is about 35% at purchasing power parity or about 27% at market exchange rates in 2008,” he said, noting that the financial crisis had led to a geographic dispersion in World Gross Domestic Product. 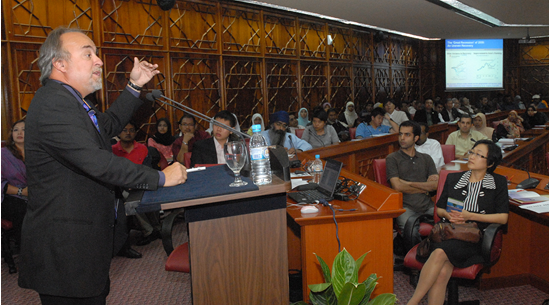 Prof Encarnation said this during a lecture on “Asia in the World Economy: Before and After the ‘Great Recession’ of 2008” at Universiti Kebangsaan Malaysia under the Harvard Ezra F. Vogel Malaysia/Singapore Initiative Public Lecture Series 2010, which was the third to be sponsored by the Lam Kin-chung Morning Sun Charity Fund of Hong Kong. He said the “Great Recession” also saw the largest decline in global wealth since the “Great Depression” of the 1930s, and the most rapid recovery, albeit an uneven one with a wide variance. However, even after the crisis, wealth still remained concentrated in the top 10 economies of USA (US$14.1 trillion in GDP), Japan (US$5.1 trn), China (US$5.0 trn), Germany (US$3.3 trn), France (US$2.7 trn), UK (US$2.2 trn), Italy (US$2.1 trn), Brazil (US$1.6 trn), Spain (US$1.5 trn) and Russia (US$1.3 trn) at market forex rates in 2009. All these 10 top economies accounted for US$43.1 trillion or 62.6% of the World GDP. By 2012, India with a GDP of US$1.8 trillion would join these 10 top economies, replacing Spain with USA retaining its top position with a GDP of US$15.8 trillion, followed by China (with US$7.2 trn), Japan (US$5.9 trn), Germany (US$3.5 trn), France (U$2.7 trn), UK (US$2.5 trn), Brazil (US$2.3 trn), Italy (US$2.1 trn), Russia (US$1.9 trn), at market forex rates. GDP is the market value of all the goods and services produced within a country and is generally used to measure the wealth and standard of living of a nation. “The BRICs are now in their 2nd decade of being centers for wealth creation,” said Prof Encarnation, who has recently retired from Harvard University where he spent the first half of his nearly 30 years of service with the faculty of the Harvard Business School. He then joined the Centre for Business and Government in the John F. Kennedy School of Government and founded the centre’s first Asia Programme. He had taught an award-winning course on Asia in the World Economy to hundreds of graduate students from Harvard, MIT and elsewhere. 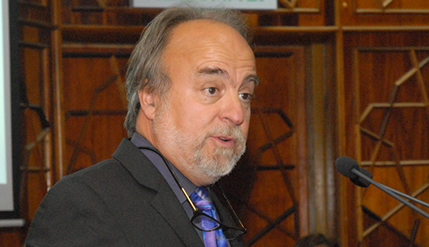 Currently, he consults for multinational corporations, government agencies and non-governmental organizations. In terms of geographic dispersion of World GDP, Prof Encarnation said the next 10 top economies in 2009 were Mexico (with a GDP of US$1.47 trillion), followed by South Korea (US$1.36 trn), Spain (US$1.36 trn), Canada (US$1.28 trn), Indonesia (US$0.96 trn), Turkey (US$0.88 trn), Australia (US$0.85 trn), Iran (US$0.83 trn), Taiwan (US$0.74 trn) and Poland (US$0.69 trn). All the top 20 economies accounted for US$53.5 trillion or 77.5% of the World GDP. He said below the BRIC, a wider geographic dispersion of wealth creation could be found across the Asia-Pacific, Europe and the Middle East. He also said that one source of recovery and growth is trade, which remains concentrated geographically where the top three – Germany, China and USA – accounted for 25% of the total merchandise exports in 2008. Another source of recovery and growth is productivity although the relative productivity of labour varies widely across geographies and sectors. “For China, India and much of emerging Asia, productivity is the next challenge… and the next opportunity,” he said.